Read further on history and biography of Guru Ramdas ji. 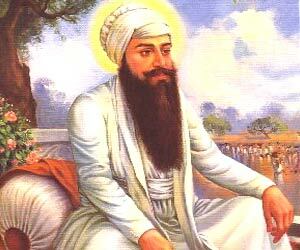 Sikh Guru Ramdas Ji was 4th Sikh guru of Sikhism. Famous composition: He contributed a total of 688 Shabads/hymns to the Sri Guru Granth Sahib. Guru Ramdas Sahib Ji - A candidate who attained the Guru ship for his qualities and not for any family relation, Guru Ramdas Sahib or Jetha ji served as the fourth Guru of the Sikhs. Born on Sep. 24, 1534 at Chuna Mandi, Lahore, Ramdas Ji was a promising child. Orphaned at the mere age of seven years, he used to earn his living by selling boiled grams at his maternal native village Basarke. It was on his condolence visit to Jetha's granny that Guru Amardas Sahib developed deep affection for (Guru) Ramdas Sahib which resulted in his shifting to Goidwal Sahib to settle there. There he started partaking in the religious congregation held by Guru Amardas Sahib along with resumption of his old profession. He was also very actively involved in the development of Goindwal Sahib. All this made him to become a favorite of Guru Amardas Sahib who married one of his daughters to Ramdas ji that brought about a deeper involvement of the latter in the activities of the Guru Ghar activities. Commanding full confidence of Guru Amardas Sahib, Ramdas Ji often accompanied him on long missionary tours to different parts of the country. An individual of considerable merit, he possessed a unique sense of piousness, fidelity, energy and articulacy. Guru Ramdas Sahib was the founder of the present day Amritsar. This new city contemporarily known as Chak Ramdas Pur flourished pretty fast for being situated at the centre of international trade routes and grew to become an important trade centre of Punjab following Lahore. The introduction of Masand system in place of Manji system by Guru Ramdas Ji played a pivotal role in the consolidation of Sikhism. His composition of 4 Lawans followed by advising the Sikhs to recite them in order to sanctify the marriages of their children came as a further strengthening of the religion. This saw the interchanging of a new matrimonial system based upon Sikhism to the ancient Vedi system of Hindus. This brought about a clear demarcation between Sikhism and the orthodox and traditional Hindu system. Fallacies, caste system and pilgrimages were strongly decried by Ramdas Ji also. He also contributed a lot to the expansion of Guru Granth Sahib Ji by writing 638 hymns in 30 ragas, including 246 Padei, 138 Saloks, 31 Ashtpadis and 8 Vars. It was after nominating his youngest son (Guru) Arjan Sahib as Fifth Nanak that he retired to Goindwal Sahib leaving Amritsar and passed away from there on September 1, 1581.